I spotted these cute purple Repetto ballerinas at No. 1/Le Jus the other day and fell instantly in love with them. What a great color I thought to myself- so vibrant and happy. The next thought that crossed my mind was, but what would I wear them with? I don't exactly have many purple items in my closet so the best solution I could come up with was to match the shoes to some statement earrings (this would work just as well with a necklace or a bracelet). You could have some dramatic earrings with purple and then the purple shoes below .... and wear whatever you want in between- like jeans and a white t-shirt. The simpler the outfit, the better. This is a pretty neat trick. It doesn't really matter what you wear, because the highlight of the outfit consists of the colorful shoes and the earrings. I have been lusting after these Del Toro slippers since I saw them on a local designer's, Tish Cox, cute feet. She is such a stylish lady with the most feminine, elegant and colorful dresses and tops you can imagine. She wears her navy blue slippers all the time and says they are really comfortable. How luxurious to sport them in a purple velvet! YUM! The Anniel ballerina flats are darling with the little stars. I love that touch of whimsy. And the Repetto's are just so comfortable. They are almost like being barefoot. Their promise is one of grace and lightness- very poetic don't you think? And what can I say about the earrings? Just that I will take one of each please!!! Thanks so much for your sweet comments yesterday! So glad you enjoyed a few facts from my world. Happy Tuesday! i want a pair of purple flats (like i realllly need a another pair?) !!! *love* the repettos - i always get compliments on mine and i would never think b/c they are so basic! I'd like to order it all to be sent to my home immediately! Great taste Albertina! Love your style. I love jewel tones so I really love purples - I've heard Repettos are great, I really need to invest in a good pair of flats! I agree...one of each please!! I adore those Del Toro slippers!!! Love this! All of these earrings are SUCH great statement pieces. Stunning! My two favorites - flats and statement earrings! Gorgeous picks. Everything you have here is beautiful. I don't have any purple in my closet, but your idea of how to incorporate is brilliant! LOVE the purple! One of my favorite outfits consists of the perfect white tee, jeans, and my fav accessories. Spot on. loving the first combination, ok, really all of them! I love the pairing-pun totally intended :) Everything should come in 2's! This post made me realize that I don't think I own anything in purple! Gorgeous picks!! 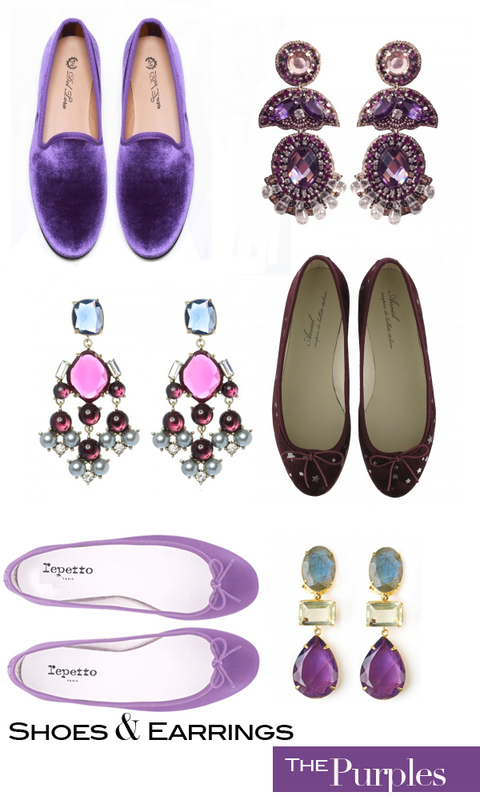 Love purple, those Repetto ballerinas are just perfect!!! gorgeous! i would love to take all of these earrings as well. makes me wonder why i don't have more sparkly earrings in my jewelry box! Aha! Im so happy someone else matches their earrings to their shoes! Anything else feels almost too matchy matchy for me! Such perfect combinations!! I rarely wear earrings other than studs but I'd gladly own any of these!